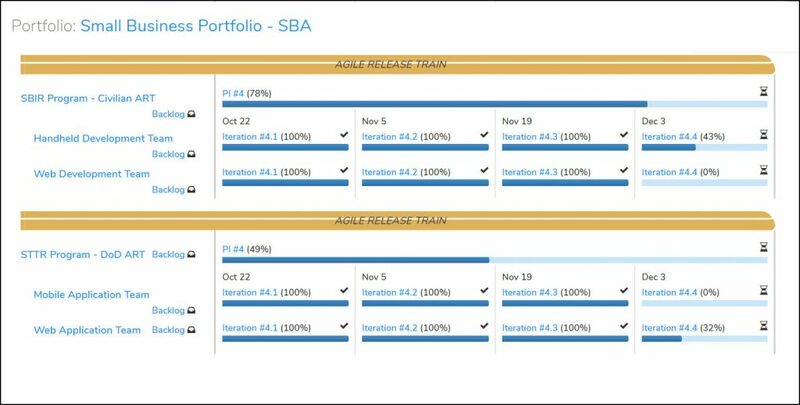 Metronome – Orchestrated Agile ®, dashboard is inspired by the SAFe Big Picture.It provides single click access on portfolios, programs (ARTs), Program Backlog, Teams, Team Backlog, current Program Increment and Iterations in one view. The user experience in Metronome clearly reflects SAFe terminology and is optimized to help the user easily navigate, search and record information.For example, the Dashboard displays a vast amount of information necessary to get the “Big Picture”. • Program Name – Name of the program for which features are being developed by the team. • Program Backlog Link – Holding area for upcoming features to address user needs and deliver business benefits for one ART. • Program Iteration (PI) – Current PI of the program with PI completion percentage. • Team Name(s) – Each team working on iterations for the PI will be listed. • Team Backlog Links – A backlog link will be present for each team working on the program. This backlog contains stories that need to be completed for the program. • Team Iterations – Four iterations are displayed on the ARTs Tab for each team. The Date, Iteration Number, and Completion Percentage can be viewed here. Each of these items has a link that may be used to accessadditional information.